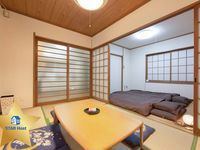 Property 2: 3min to Station "Kiyomizu Vacation Stay"
Property 5: Spacious&Clean. Near Kyoto sta. Property 11: This apartment hotel faces Kitayama-dori in Kyoto.From Karasuma Line Kitaoji Station on the city bus [North 1] [Jenetajimae] bus stop and get off at the opposite building. This apartment hotel faces Kitayama-dori in Kyoto.From Shidamaru Line Kitaoji Station on City Bus Kita 1 【Jenetraji Mae】 Get off at the building. Property 12: This apartment hotel faces Kitayama-dori in Kyoto.From Shidamaru Line Kitaoji Station on City Bus Kita 1 【Jenetraji Mae】 Get off at the building. 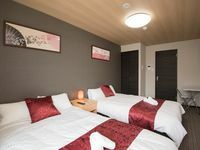 Property 35: Gion 2 bedrooms for max 5 people. This apartment is in a block that seems to be purpose built for airbnb and as such is beautifully fit for purpose. The apartment is well designed, seems very new, is exceptionally clean and has everything you could need - bathroom, toilet, beds, kitchenette and a washing machine (note no dryer - but there is some hanging space and with the spin cycle and laying the clothes out thoughtfully everything was dry after a day of exploring). The location is great, only a ten minute walk from Nijo station and 15/20 to the Nijo castle, in what seems to be a non-touristy area. This meant we were able to get some fantastic cheap eats at very authentic places - be sure to try the ramen in the local pedestrian shopping arcade (the place with the sign in english telling people to go in) The only trouble we had was the door lock combination provided didn't work and it was a little tricky to find. Locating the place was easily solved once we referred to the instructions provided (always follow instructions) but the combination was a little more challenging. Happily Nobu responded to our email for help very quickly (within 10 minutes) and resolved the issue on the spot so we were able to enter. Highly recommend, great home base for exploring Kyoto if you like to be a little removed from the really touristy areas. This flat is Japanese styled. It is really suitable for travellers as the daily supplies are given and the location is easy to find . We have seen the landlord once because we have lost the key. The landlord is so friendly and kind . He brought the key to us immediately at night.